Petunias have long been the most popular flowering annual plant for use in hanging baskets, window boxes and for border plantings. There are many single, ruffled and double flowering varieties available in a rainbow of colors. There are about 35 true species of Petunia worldwide, but the vast majority of the Petunias that are available in nurseries today are hybrids of twelve South American natives. 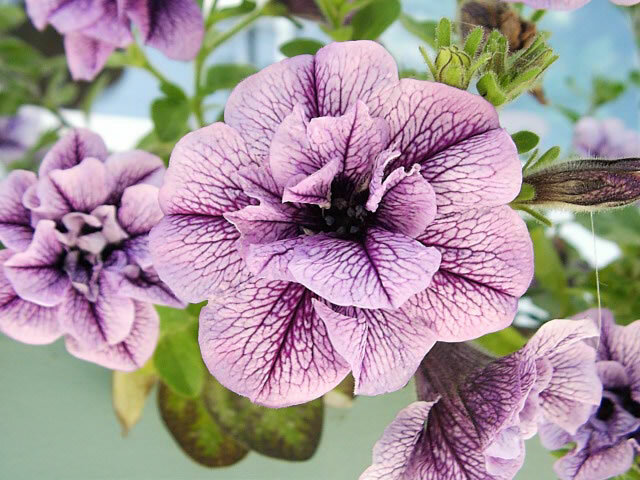 The earliest hybrids were crosses between the white flowering Petunia axillaris and purple flowering Petunia integrifolia. 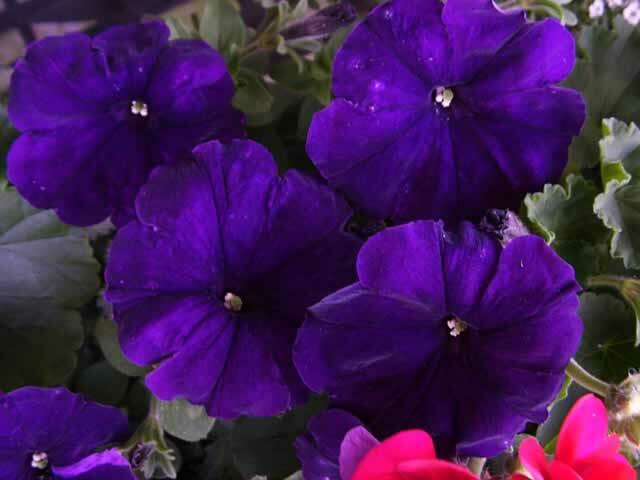 Today, hybrid Petunias can be found in almost every color except orange, as well as some ruffle flowered varieties. Petunias are broken down into four different classifications. Grandiflora Petunias produce huge 6"-7" flowers on 12" tall, sprawling plants. Multiflora varieties produce an abundance of 2"-3" flowers on compact 12" plants. that produce a profusion of small flowers. Pendula Petunias are trailing plants that are usually grown in hanging baskets, allowing the 18" stems covered with 1"-2" blossoms to cascade down. Petunias are frost tender plants that are only hardy in zones 9-11, so they are almost always grown as annuals. Bedding plants should be planted 12" apart in full sun. These fast growing plants require a rich, light soil with good drainage. Some large Grandifloras are easily damaged by rain. Provide shelter from strong winds. 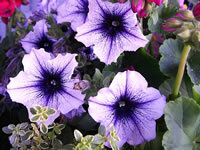 Feed Petunias monthly during their blooming season, with a good all-purpose soluble fertilizer. they should only be watered when the soil becomes dry. Pinch back plants hard when they are 4"-6" tall to encourage branching. Deadhead regularly to induce new blooms. so they must not be covered. Petunias are easily grown from seed which can be sown indoors 10-12 weeks before the last killing frost. Cover the tray with a sheet of glass for extra humidity, until germination. Maintain a temperature of 70°-75° within the the growing medium. 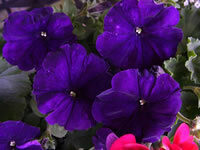 Double flowering Petunias and some hybrids may require 80° for germination.